A specially designed formula to supply working muscles with the essential nutrients needed for recovery post-exercise. 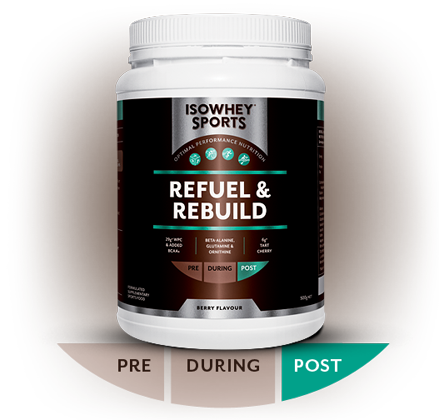 Refuel & Rebuild combines pure whey protein, added BCAAs (2:1:1), beta-alanine, glutamine, magnesium and tart cherry. As part of a healthy and varied diet, protein is necessary for tissue building and repair and contributes to a reduction of tiredness and fatigue and is also necessary for normal protein synthesis. More than 25g* pure whey protein from WPC per serve for muscle synthesis, recovery and repair. Added BCAAs for protein synthesis and recovery. Amino acids consumed after exercise helps to maintain muscle and support recovery processes. Magnesium contributes to normal muscle function and metabolism. Over 6g* of antioxidant tart cherry per serve, which contains anthocyanins, phenols and flavanols. L-glutamine is used in muscle glycogen resynthesis. L-ornithine is an amino acid involved in excretion of ammonia, which can interfere with the production of energy. Mix 1 serve (1.5 scoops =50g) into 200mL of water, milk or milk substitute. Consume after exercise once or twice daily. INGREDIENTS: Whey protein concentrate (58%), maltodextrin, tart cherry powder, L-glutamine, L-arginine monohydrochloride (0.9%), beta-alanine, magnesium gluconate, sunflower or soy lecithin, natural flavours, L-leucine (0.34%), L-ornithine monohydrochloride, L-valine (0.17%), L-isoleucine (0.17%), sweetener (steviol glycosides). WARNINGS: Contains milk and soy products. Not to be used as a sole source of nutrition. Should be used in conjunction with a balanced diet and appropriate exercise program. Not suitable for children under 15 years of age or pregnant women: Should only be used under medical or dietetic supervision.